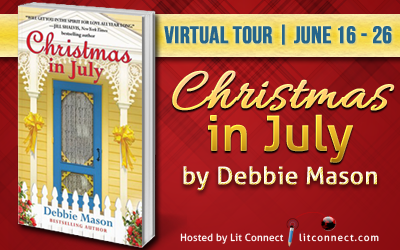 It's a pleasure to welcome the Debbie Mason Christmas in July blog tour to The Romance Dish today. 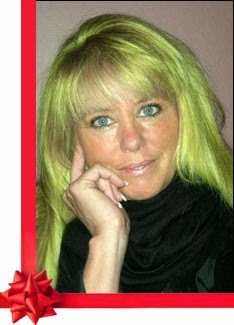 I first discovered Debbie through her paranormal romances written as Debbie Mazzuca and followed happily when she began writing contemporary romance under the name of Debbie Mason. 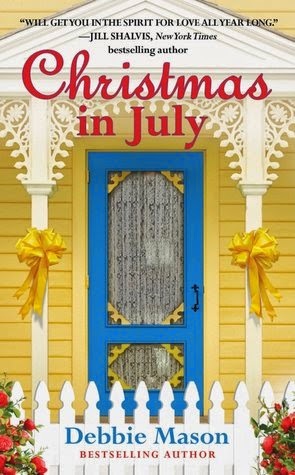 Her first book in the Christmas, Colorado series, The Trouble With Christmas was a delightful introduction to this small mountain town with its quirky inhabitants (read my review here) and has me eagerly anticipating a return visit with the release of Christmas in July later this month. Black Hawk pilot Jackson Flaherty, along with his crew and reporter Maria DeMarco, had been held captive in Afghanistan for seventeen months. Three weeks ago, they'd escaped their captors and are now back in the US. Experience? Interesting choice of word to describe over a year in captivity, Jack thought, but let it go. He was due some serious R and R and had already lost several days being debriefed, poked, prodded, and analyzed. It was standard procedure, but there were other things he wanted to be doing—like Maria DeMarco, the reporter they had been sent in to rescue when the RPG—rocket-propelled grenade—brought down his Black Hawk seventeen months ago. The beautiful, voluptuous brunette was exactly the type of woman Jack was attracted to. Smart and aggressive, she was an adrenaline junkie like he was, and more importantly, she wasn’t looking for a ring on her ﬁnger. During their captivity, with an attentive audience, they’d had little opportunity to do more than talk and steal a kiss or two. And even though they’d had the freedom and privacy to do a whole lot more while they were on the run, all they’d managed was one very hot, very steamy make-out session. He planned to rectify that now. Jack headed for the door. “Thanks, Doc, I’m sure I’ll ﬁgure it out.” Learning the blow he’d taken to his head in the crash had stolen the last four years of his life had taken some getting used to. But what no one seemed to understand was that Jack felt lucky just to be alive and back in the good old U.S. of A. There were a lot of guys who’d lost far more than he had. Jack stopped in his tracks and swung his gaze to the doctor. “What do you mean, my sister’s on her way?” Jill hadn’t mentioned coming to Virginia. He’d told her that, once things were squared away on his end, he’d head to Colorado. But now that he thought about it, she had sounded like she was holding something back during their conversation. At the time, he’d put it down to shock at his return. Avoiding Jack’s gaze, the man shufﬂed the papers on his desk and cleared his throat. The cell phone Jack had been given pinged. He held up a ﬁnger, cutting off the doctor’s explanation, and read Maria’s text. Once he ﬁnished, Jack narrowed his eyes at the man who was putting a serious crimp in his plans. “Thanks to you, Doc, I’m going to have one unhappy woman on my hands.” Hot-tempered and dramatic, Maria’s reaction to this latest delay in their one-on-one time would no doubt be over-the-top. Her intensity was a little unnerving at times, but his hope that she’d bring some of that passion into the bedroom outweighed the discomfort. “You don’t know the half of it,” the doctor murmured. Before Jack could question the man’s odd remark, another text popped on the screen. Maria was on the base. He shouldn’t be surprised. The woman was also tenacious and enterprising. Two traits he admired, but not necessarily when they were applied to him. “I’ll be back in a minute,” he said, opening the door to step into the corridor. Readers, do you enjoy amnesia stories? Second chance love stories? In her husband's absence, Grace has made a name for herself as the best baker in Christmas. Do you bake? Do you have a specialty? What's your go-to baked item for special celebrations? If you don't bake yourself, what guilty pleasure item do you enjoy buying when you visit a bakery? One US/Canada commenter from the entire tour will win a Barnes & Noble Nook, plus a digital copy of THE TROUBLE WITH CHRISTMAS. The more stops readers leave a comment on, the greater their chances of winning! Please see the Rafflecopter widget for full Terms & Conditions and directions on entering. I love 2nd chance love stories and have been waiting for this book. Have the previous one on my tbr. And I LOVE to bake. Some of my specialities are pecan pie, and to die for 3 tier choc cake made with bittersweet choc and bittersweet frosting. Also have made a yummy banana cake from Susan Mallery's cookbook and a wonderful banana bread and choc fruitcake from Debbie Macomber's cookbook and one of her books. I tell you, the cookbooks these authors (incl Sherryl Woods') have put out have the most wonderful recipes in them. I have made so many that are to die for. Big fan of second chance stories (my marriage is a second chance story) and the excerpt makes me what to read Christmas in July! As far as baking, I'm known for my Red Velvet cupcakes with homemade cream cheese frosting. I love to make bundt cakes and quick breads of all kinds. What a great story premise, even though I'm not always a fan of second-chance stories. Love the title, too. Thanks for stopping by TRD today, Debbie! I'm coming to your house, Deb! I'd go for any (or all) of those goodies! I love second chance stories. I do bake some. Lately have been on cup cakes. I also bake cookies and other things. At Christmas its always pecan pies. I usually get stuck with bring deserts. I do love , well, any chance at love...so why not a second one? And I am excited because PJ has done it again..I am eager to read your work now!! As for baking. I have been very into healthful eating and nutrition this decade and the baking I do is to find delicious alternatives to using sugar and additives that are not that healthy. I have found a few recipes that became staples. One for a blueberry crumb cake. It is delicious and yes, healthful! Thanks again PJ and Debbie, looking forward to all your work. I can hardly wait for this book to come out. I loved the first one and got a lot of friends to buy it... I am counting the days to get it!!! Huge lover of 2nd chance.... I married an boyfriend that I dumped in high school.... but he's forgiven me and we've been married for over 30 years. I do like second chance stories. The only thing I bake is tollhouse chocolate chip cookies. My favorite baked dessert is cheesecake! I don't do as much baking as I used to, but I was known among my friends for my gingerbread houses (complete with candy windows and icicles hanging from the on the roof). I read THE TROUBLE WITH CHRISTMAS and thoroughly enjoyed it. Ms. Mason writes with a nice sense of humor. I remember well Grace and her heartbreak over the loss of her husband. Jack was an important character in the first book even though he wasn't there. It helped show the character of the small town, and the deep love Grace had for her husband. It will be lovely seeing her happiness restored. I love to bake, but haven't done much lately.. A favorite is Swiss Merengue Horns. They are melt in your mouth good and not as difficult to make as they seem. I like 2nd chance stories but I don't recall reading one with an amnesia factor. I like to bake but I mostly do it for special celebrations. I usually make coffee cake or cheesecake.